Gerard Pique accused Real Madrid's Sergio Ramos of "aggression" towards Barcelona forward Lionel Messi during Saturday's LaLiga Clasico. 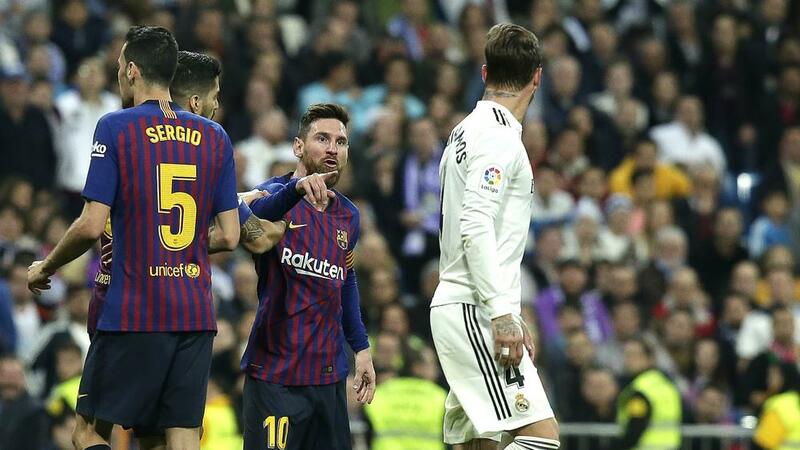 Lionel Messi had blood in his mouth after a clash with Real Madrid defender Sergio Ramos during Saturday's LaLiga Clasico, claims Gerard Pique. Messi and Ramos were involved in a flashpoint in the first half of Barca's 1-0 win at the Santiago Bernabeu that moved Ernesto Valverde's men 10 points clear at the top of the LaLiga table. Ramos knocked the ball past Messi but then seemed to thrust his arm into the face of the Barcelona captain, who made his displeasure clear to the officials, although Madrid's skipper was not punished. Former Madrid head coach Jose Mourinho used an appearance as a pundit on beIN SPORTS to intimate Ramos had deliberately hit Messi to spark life into his spluttering side. Ramos denied that was the case in a post-match interview but the defender's Spain team-mate Pique was clear on who was to blame over the controversial incident. "Leo had blood in his mouth," said Pique. "It was an aggression. "Intensity does not have to be measured. I get along great with the Real Madrid players. "But when you go out to the field you defend your colours and the rivalry is what you get. "But once the game is over, the cordiality is mutual, the players respect us very much." Barca also won at the Bernabeu on Wednesday, their 3-0 success at Madrid's home booking a place in the final of the Copa del Rey for the sixth year in a row. Valverde's men have therefore made history by becoming the first team to win three consecutive away games against Madrid. The Barca boss insists the title race is not over, with Atletico Madrid having a chance to move back within seven points of the leaders at Real Sociedad on Sunday. But Pique knows Barcelona are well on track to defend their LaLiga crown after another win at the Bernabeu. "I have lived these games since I was a child," added Pique. "I know how hard it is to win here, we knew how to suffer when we had to do it and we took advantage of our chance. "I think we played better than the other day, even if the result is closer. It's a boost for the league, it gives us a certain tranquility in the face of the next matches."